For many industrial applications, ECC provides not just plastic floating balls, but a solution to a problem. Most of our successful installations have resulted from working closely with customers, sharing our ideas and experience and tailoring a solution to meet their specific requirements. ECC hollow plastic floating ball tank covers provide highly effective solutions to difficult liquid storage problems in industries including Processing, Petrochemical and Metal Treatment. By placing a sufficient quantity of hollow plastic floating balls onto the surface of a liquid, the balls automatically arrange themselves into a close packed formation over 91% of the surface area. This high surface coverage provides an extremely effective barrier and significantly reduces the mass and heat transfer mechanisms operating between the liquid and surrounding environment. The hollow plastic floating balls form a floating cover for ponds, tanks, lagoons, and other basins. The plastic balls are of course hollow and full of air. And the plastic floating balls offer very low heat conductivity. Together, these properties result in a very effective thermal insulation barrier. The air pockets between the balls — although not sealed — also contribute to this cellular insulation system, dramatically reducing heat loss. The barrier works both ways: the low liquid surface area exposed to atmosphere dramatically reduces liquid loss through evaporation and odor release to the atmosphere. It also prevents surface absorption of oxygen. Yet this barrier to the elements does not present an obstacle to product dipping or equipment moving through the liquid surface. The plastic balls are pushed aside, but quickly re-form their cover as the equipment moves forward or products are lifted away from the tank. 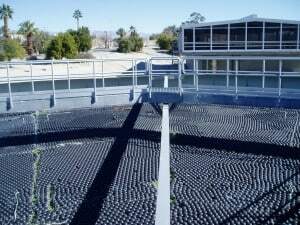 The plastic balls will rise and fall with liquid level within storage tanks, and also provide a constant floating cover over liquids held in reservoirs with sloping sides. If the liquid level falls — causing the surface area to shrink — the balls simply stack in a double layer; they automatically spread themselves into a single layer again as the level rises. What are the advantages of using ECC Floating Plastic Balls? See How our Products are Being Used Everyday! ECC has more than 30 years experience in the design and distribution of hollow plastic balls. More than 35,000,000 plastic balls have been delivered as floating covers.